The North American Pet Health Insurance Association presented new research for veterinarians at the annual meeting of the American Animal Hospital Association. The research highlights the 10 best practices used by veterinarians who are most successful in educating clients about the benefits of pet health insurance. Nashville, TN, April 01, 2017 --(PR.com)-- Veterinarians have the ability to significantly improve patient care and increase revenue by strategically encouraging the use of pet health insurance. That was a key message at a presentation today by John Volk, senior consultant, Brakke Consulting, at the annual meeting of the American Animal Hospital Association (AAHA). Volk presented 10 “best practices” used by veterinarians who are most successful in educating clients about the benefits of pet health insurance. Volk was speaking on behalf of the North American Pet Health Insurance Association (NAPHIA). NAPHIA is the association of pet health insurance (PHI) organizations in Canada and the United States. NAPHIA’s membership makes up over 99% of all pet health insurance coverage in effect in North America. Research conducted by NAPHIA demonstrated that the majority of veterinarians wish all their clients had pet health insurance. In related research, 50% more pet owners said they would purchase pet health insurance if their veterinarians actively recommend it. - Produces increased expenditures on pets by clients. 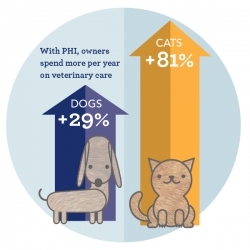 So what is the most effective way for veterinarians to help grow pet health insurance use? To find out, Volk and NAPHIA conducted in-depth interviews with veterinary practices that had larger-than-average numbers of insured patients. There were 10 things that were common to a majority of the practices interviewed. 1. Select one, or at most two, pet insurance companies to support. Pet owners are looking for a recommendation, not several choices. If there are brochures from three or four insurance companies in the waiting room, the client likely won’t follow through with any. 2. Designate one or two key staff members as the pet insurance specialists. Typically these would be full-time receptionists, hospital administrators and/or practice managers. The designated pet health insurance specialist should be familiar enough with the recommended companies to answer basic questions. 3. Talk to the client about pet health insurance. Distributing brochures is fine, but won’t get the job done. A staff member should discuss pet health insurance with the client, then give them a brochure so they can go online or call to get more information, and perhaps purchase a policy. 4. Provide a link on the practice website to the pet insurance company or companies recommended by the practice. This makes it easy for the client to obtain more information, and makes the practice the gateway to more information about pet health insurance. 5. Determine which clients already have pet health insurance. Each time a client schedules an appointment or visits the practice, ask if the pet has pet health insurance. Over time, this will provide a census of the patients that are insured. It will also help measure if the practice’s efforts to increase use of pet health insurance are gaining traction. 6. Note pet health insurance company and claim number in patient record. This informs veterinarians and staff that treatment costs may qualify for reimbursement and can facilitate decision-making when discussing options with the client. 7. Submit claims. Keep copies of claims forms with the pet’s policy number in the patient file. Then submit claims after procedures. Practices that have the best success in fostering the use of pet health insurance volunteer to submit claims on behalf of clients. This makes it much more likely that claims will be filed and paid in a timely manner, often before the client’s credit card bill is due. Submitting claims can actually save the practice time because it minimizes callbacks from insurance companies for more information. 8. Make pet insurance an employee benefit. Practices that offer this benefit take several different approaches: one pet per employee; a specific amount toward insurance premiums per month; or an escalating amount based on length of service. It also provides a perfect answer when the client asks a staff member, “Which company do you use?” In the NAPHIA research, pet owners said they were 71% more likely to purchase pet insurance in the veterinary practice insured staff pets. 9. Recommend 30-day no-cost trial policies. Where allowed by state Departments of Insurance, some pet health insurance companies offer 30-day no-cost introductory policies. Consider having clients activate the introductory policy from their smartphone before they even leave the practice. 10. Engage the whole practice. Every employee from owner and associate veterinarians to kennel attendants should be enlisted in the campaign to increase use of pet health insurance. They need to be educated about the value of pet health insurance to their work and income, as well as the practice’s reasons for supporting pet health insurance. They don’t need to be experts, just reinforce that the practice thinks pet insurance is a good thing for clients to consider. The North American Pet Health Insurance Association (NAPHIA) is comprised of pet health insurance (PHI) organizations from across Canada and the United States. NAPHIA’s membership makes up over 99 per cent of all pet health insurance coverage in effect in North America.